Last night Jack and I went up to H St. in DC and hit up Biergarten Haus for Liz and Amber’s send off party. (They are going to climb in Colorado and Utah for a month. So jealous.) We got there at 6:30 and it was nice and empty! We headed out back to sit under the awning, since it looked like rain, although it was damn hot. I looked at the beer menu and was a little disappointed. They had taken off all their darker beers and smoke beers for the summer and replaced them all with Hefeweizens. 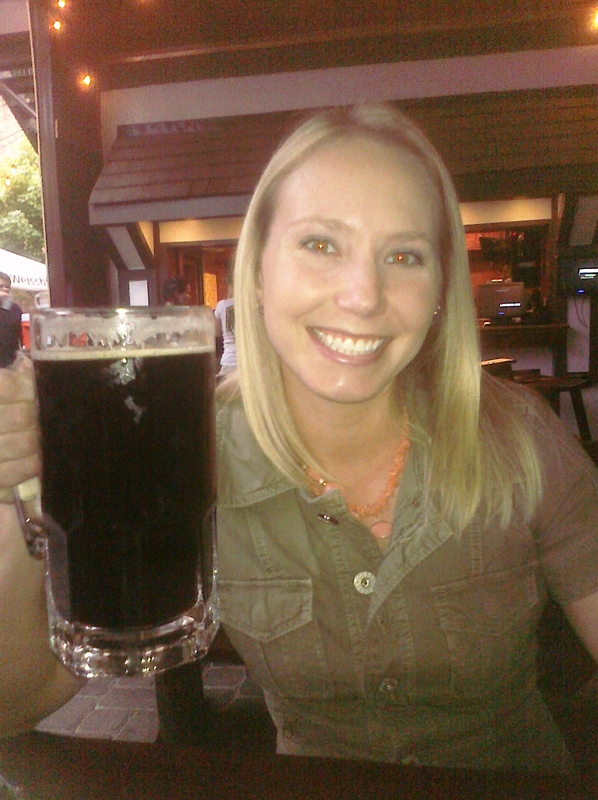 (Nothing against Hefes, I just like me some dark beer!) So I decided to try the Kostritzer Schwarzbier. It was dark and very lagery. Not like the dark beers I’m used to. Oh yeah, and I decided to go all in and get the full Liter! Thank goodness it was only 4.8% alcohol because I had to drink it somewhat fast because it was so hot out. Our waiter was awesome, his name was Zigi and he had an awesome German accent! They also have pretty good food there, I didn’t really get to eat an actual dinner because I stuffed myself on their hot, chewy pretzel bites. Lots of people came. I got drunker, ordered a Hefe somewhere in there (a half liter), and stopped taking pictures. And since I have to get up terribly early we left before the group made it down to Dangerously Delicious (sweet and savory pies!). So I didn’t get any pie, so sad. But, it didn’t rain, and we didn’t get jumped or killed on the way back to our car. Winning! This weekend I’ll be heading to the Gunks, NY near New Paltz to go climbing! I hope they have some good places for beer in town!